La investigación sobre relaciones entre pares y apego de pares es escasa, y más aún en las poblaciones de habla hispana. Los objetivos de este estudio fueron: (a) adaptar el Quality of Relationships Inventory al español y (b) evaluar sus propiedades psicométricas en el contexto de las relaciones de pares en una muestra de N = 269 adolescentes peruanos. La consistencia interna fue adecuada. La estructura factorial se evaluó mediante análisis factorial confirmatorio (AFC) y escalamiento multidimensional (MDS). La validez convergente se exploró a través las asociaciones entre las subescalas del QRI y las subescalas de pares del Inventory of Parent and Peer Attachment (las correlaciones fueron entre r = 0,37 y r = 0,61) y la validez discriminante, mediante las asociaciones entre las subescalas QRI y síntomas internalizantes y externalizantes (las correlaciones oscilaron entre r = 0,27, y r = 0,35). Los resultados mostraron que el QRI es una herramienta fiable para la evaluación de la calidad de las relaciones adolescentes entre pares dentro de un contexto peruano, tomando en consideración algunas particularidades de la escala de conflicto. The Quality of Relationships Inventory (QRI; Pierce, 1994; Pierce, Sarason, & Sarason, 1991) was developed as an alternative to the existing instruments of social support which only addressed general perceptions of available support. The QRI differentiates itself by the assessment of relationship-specific perceptions of available social support, interpersonal conflict, and relationship depth for each of several significant relationships. This added value allows the instrument to explore attachment bonds among different relationships, such as family members, romantic partners, friends, and peers (Pierce et al., 1991). Attachment theory is a conceptualization of the human ability to develop affectional bonds towards others to whom one can orient to in situations of stress (Simpson & Rholes, 2012) as well as of the distress generated by separation and loss. Bowlby (1982) developed the attachment theory to define the biologically based bond between the child and the caregiver, which is fundamental to the survival and protection of the child. In this regard, attachment behavior is defined as any form of conduct that results in attaining or maintaining proximity to another individual who is conceived as better able to cope with the world (Bowlby, 1988). The first attachment process occurs in early childhood and is the basis for the development of future affectional bonds. In this development of future relations, adolescence acquires particular importance as it is a stage where new bonds outside the family system start to develop (Armsden & Greenberg, 1987; Gorrese & Ruggieri, 2013). In this process, parental attachment remains crucial, but there is also a shift from parents to peers in terms of proximity seeking (Nickerson & Nagle, 2005). Theoretically, adolescents who have developed a secure attachment with their primary caregivers during childhood would be more likely to develop healthy relationships with their peers (Gorrese & Ruggieri, 2013). This hypothesis has been supported by different studies that have reported an association between parent and peer attachment (Delgado Gallego, Oliva Delgado, & Sánchez-Queija, 2011; Gorrese & Ruggieri, 2012). Moreover, the QRI subscales for relationship-specific perceptions have been linked to early attachment experiences of parental bonding (Sarason et al., 1991). Both parent and peer attachment are known to serve a similar function for adolescent adjustment. While parents have the task of ensuring comfort and protection while promoting exploration, peer relations are essential for the taking place of that exploration process, as well as for identity development. It has been reported that adolescents that score high on peer but low on parent attachment are better adjusted than those who score high on parent but low on peer attachment, indicating that peer attachment may have a different and substantial impact on adolescent adjustment (Laible, Carlo, & Raffaelli, 2000). Therefore, there is not only a transfer of attachment functions from parents to peers, but rather a process where peer attachment may have a differential influence on adolescent functioning (Nelis & Rae, 2009). Consequently, social relations and attachment with peers become important topics as they are elements that can have an impact on adolescents' mental health. On the one hand, social support and healthy peer relations can be protective factors for coping with stressful situations in adolescence, like, for example, exposure to violence and trauma (Bal & Jensen, 2007; Hammack, Richards, Luo, Edlynn, & Roy, 2004). Moreover, secure peer attachment among adolescents is inversely associated with mood disorders (Millings, Buck, Montgomery, Spears, & Stallard, 2012), depression, and anxiety (Nelis & Rae, 2009), and directly associated with selfesteem and empathy (Gorrese & Ruggieri, 2013), which in turn are linked to prosocial behaviors (Carlo, McGinley, Hayes, & Martinez, 2012). On the other hand, a large body of literature suggests that when social relations with peers are characterized by conflict, they can become a risk factor for psychological outcome. Different types of negative peer relations, such as conflict, peer rejection, social withdrawal, and avoidance of peer interaction are related to the development of psychopathology in childhood and adolescence (DeaterDeckard, 1998). Additionally, low quality of peer attachment has been associated with an increased risk for internalizing symptoms in adolescence (Tambelli, Laghi, Odorisio, & Notari, 2012). Having stated the associations between peer relations and adolescent psychological functioning, the need for reliable tools for the measurement of this construct becomes evident. The QRI (Pierce, 1994; Pierce et al., 1991) is a renowned and reliable tool for the assessment of quality of relationships among different populations. This instrument was developed to assess relationship-specific perceptions of available support, interpersonal conflict, and relationship depth for each of several significant relationships, for instance, parents and peers (Pierce et al., 1991). The QRI is a 25-item self-report questionnaire with factor structure and internal consistency estimates that have been shown to remain stable across countries like United States, Germany, and Belgium (Pierce, Sarason, Sarason, Solky-Butzel, & Nagle, 1997; Pierce et al., 1991; Reiner, Beutel, Skaletz, Brähler, & Stöbel-Richter, 2012; Verhofstadt, Buysse, Rosseel, & Peene, 2006) and it is a commonly used instrument in the literature of peer attachment. This instrument has been used both in adult and adolescent populations. Among adults, the QRI has been used to assess romantic couple relationships, social support, and relation-specific expectations for support (Brackett, Warner, & Bosco, 2005; Gurung, Sarason, & Sarason, 1997; Holt & Espelage, 2002; Pierce, Sarason, & Sarason, 1992). Among adolescents, the QRI has been used for research assessing the characteristics of peer relations, parent relationships and romantic relationships (Galliher, Welsh, Rostosky, & Kawaguchi, 2004; Swenson, Nordstrom, & Hiester, 2008; Pierce et al., 1992). Nevertheless, to date, there is no adaptation of this instrument for Spanish-speaking adolescent populations. Therefore, the main objectives of this study were: (a) to adapt the QRI to Spanish and (b) to assess its psychometric properties in a sample of Peruvian adolescents. For this, reliability, factor structure, and both convergent and discriminant validity were explored. For the latter, additional measures of peer attachment and symptoms were considered. This study provides with a Spanish version of a measurement tool that will allow continuing the line of research of peer attachment and adolescent's mental health in Spanish-speaking populations. The current study was part of a larger longitudinal study about complex trauma, environmental adversity, and adolescent mental health in Lima, Peru. A sub-sample of 269 adolescents aged between 12 and 16 years (M = 14.16, SD = 1.54) that completed the QRI at a first time of data collection (that was used as a pilot study) was considered for the psychometric sections of this cross-sectional study. Data collection took place at a public high school in Villa El Salvador, Lima, Peru. Equal gender distribution was aimed for, achieving a final sample of 50.2% girls and 49.8% boys. Inclusion criteria for the study were: being born in Peru, being between 11 and 18 years old, and attending a public school in Villa El Salvador, Lima. A subsample of 218 participants aged between 12 and 16 years (M = 14.15, SD = 1.54), 47.7% girls and 52.3% boys, that completed other measurements was used for the analyses concerning discriminant and convergent validity. After the researchers received the signed consent of the school authorities, the students were provided with information about the study, ethical considerations, confidentiality, and anonymity. Students who voluntarily agreed to participate signed an informed consent form. Participants were given oral and written instructions about the procedure and completed the self-report questionnaires during class hours. The overall (longitudinal) project was approved by the KU Leuven University Social and Societal Ethics Committee. The adaptation process of the instrument followed commonly used guidelines for instrument adaptation and recommendations of the International Test Commission. The English version of the QRI was translated into Spanish and then reviewed by an expert panel. Modifications were made in order to maintain conceptual meaning and to make items comprehensible for developmental age. Next, the back translation was performed, and the back-translated version was compared with the original English version of the instrument. Quality of Relationships Inventory. The QRI (Pierce et al., 1991) is a 25-item self-report questionnaire that assesses the perceived availability of social support from specific relationships, the extent in which the relationship is perceived as positive, important, and secure, and the extent in which the relationship is a source of conflict and ambivalence. The internal structure of the instrument consists of three subscales: support, conflict, and depth. Internal consistency coefficients found in the context of peers or friend relationships were α = .85, α = .91, and α = .84 respectively (Pierce et al., 1991). For this study, participants were asked to respond to this questionnaire after selecting one “best friend”. All items were answered in regard to the selected peer. Inventory of Parent and Peer Attachment. The Inventory of Parent and Peer Attachment (IPPA; Armsden & Greenberg, 1987) is a 75-item self-report questionnaire that measures the perceived quality of attachment of teenagers to their parents and peers. The instrument assesses three dimensions: trust, communication, and alienation. The revised IPPA was translated to Spanish in Colombia (Pardo, Pineda, Carrillo, & Castro Tejerina, 2006) and its psychometric properties were established. For this study, only the peer scales (communication, trust, and alienation) of the Spanish version were considered. The combined internal consistency index for these scales was α = .90. Youth Self-Report. The Youth Self-Report (YSR; Achenbach & Rescorla, 2001) is a self-report questionnaire for adolescents between 11 and 18 years of age that verifies eight first-order syndromes and two second-order factors: the internalizing dimension, covering anxious-depressed, withdrawn-depressed, and somatic complaints syndromes, and the externalizing dimension, including rule-breaking behavior and aggressive behavior syndromes. For this study, only these two factors were considered. The YSR has been used in a wide variety of cultures and shows adequate psychometric properties based on evidence of its validity, reliability, and temporal stability (Achenbach & Rescorla, 2001). The Spanish version was acquired for this study through the Achenbach System of Empirically Based Assessment. In our study, we found an internal consistency index of α = .89 for the internalizing factor and of α = .93 for the externalizing one. Measurement reliability was assessed by means of internal consistency indices. Factor structure and dimensionality were explored using confirmatory factor analysis (CFA), measurement invariance, and ordinal multidimensional scaling (MDS) analyses. Finally, convergent validity was evaluated by analyzing the correlations between the QRI and the IPPA-R peer subscales and discriminant validity was explored through the correlations between the QRI subscales and both internalizing and externalizing symptoms. For MDS analyses RStudio version 0.98.1091 package Smacof was used. For CFA and measurement invariance analyses Mplus version 7 was used, with MLR estimator and with the allowing of error correlations within same subscales when theoretically justifiable either because of similar wording or equivalency in the construct measured by the item. For all other analyses, IBM SPSS version 22 was used. The means, standard deviations, skewness, kurtosis, and internal consistency estimates of the QRI subscales are presented in Table 1. Reliability tests showed acceptable to good internal consistency indices for all the subscales (ranging from α = .733 to α = .826). Additionally, age and gender effects were explored. No correlations were found between age and the subscales of the QRI (p > .05). Independent t-test results indicated higher scores for the positive aspects (support and depth) and lower scores for the negative aspects (conflict) of peer relations for girls. In detail, higher scores of support were found among girls (M = 3.149, SD = .829, n = 135) compared to boys (M = 2.589, SD = .689, n = 134), t (267) = -6.024, p < .001, 95% CI [-.742, -.376]. Similarly, higher scores of depth were found among girls (M = 3.042, SD = .647, n = 135) compared to boys (M = 2.656, SD = .745, n = 134), t (267) = -4.535, p < .001, 95% CI [-.553, -.218]. Finally, higher scores of conflict were found among boys (M = 2.056, SD = .539, n = 134) compared to girls (M = 1.858, SD = .448, n = 135), t (267) = 3.280, p = .001, 95% CI [.079, .317]. Note. N = 269. Standard error for skewness was .150 and for kurtosis .296. Correlations among all study variables are presented in Table 2. Note. N = 218 *p < .001. A CFA was estimated to assess the three-factor structure of the instrument. The theoretical model (Pierce, 1994) was carried out, and four items (7, 9, 24, 25) showed standardized factor loadings that were lower than the cutoff point of .40 (Stevens, 1992). The three-factor model showed acceptable fit indices in terms of RMSEA but not in terms of comparative fit indices (Hooper, Coughlan, & Mullen, 2008) as indicated in Table 3. Lai & Green (2016) have shown how RMSEA and CFI can show inconsistent evaluations of fit (or misfit), and how such inconsistency is not necessarily diagnostic of particular problems in model specification or data. For more information on the causes of these inconsistencies please refer to Lai & Green (2016). The standardized factor loadings for the whole sample are presented in Table 4. 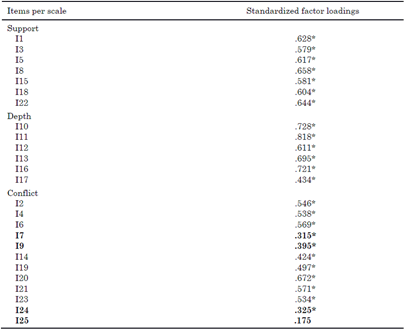 In addition, the intercorrelations among subscales are presented (see Table 2). Support had a significant, strong and positive correlation with depth (r = .753, p < .001) and had no correlation with the subscale of conflict. In addition, depth had a significant weak association with conflict (r = .270, p < .001). Finally, measurement invariance across gender was assessed, and metric invariance was accounted for (RMSEA = .079, CFI = .747), indicating a same factor structure and equal slopes across groups. These results imply that a one-unit increase in each factor has the same meaning across gender. Nevertheless, scalar measurement invariance was not accounted for, indicating that the intercepts across groups are not equal, which was expected, according to the previous results that showed that higher scores of support and depth were found among girls and higher scores of conflict were found among boys. To further interpret these results, an ordinal multi-dimensional scaling (MDS) analysis was estimated. The item-correlation matrix was transformed into a matrix of dissimilarities that was then used for the analysis. The results of the MDS show a graphic representation of the Euclidean distances between items of the QRI and the respective location of each item in the low-dimensional space (2D). An ordinal representation showed to fit well the data, according to the Sheppard diagram (Figure 1). Figure 1 Sheppard diagram for MDS analysis. The graphical representation of the underlying structure of the QRI is presented in Figure 2. The general non-metric stress for the MDS solution (2D) was .33 and stress per point ranged from .058 to .025. Figure 2 clearly shows the conflict subscale clustered to the left of the horizontal dimension of the plot, unrelated to the other two subscales. On the other hand, support and depth are also differentiated as separate scales, but they do show a strong association with each other. Figure 2 Configuration plot QRI. For convergent validity, correlations between the QRI subscales and the peer subscales of the IPPA were explored. Both of these instruments have two positive subscales of aspects of relationships and one that refers to negative aspects. The correlations between the subscales were in the expected directions. The first subscale Support had a strong strong positive correlation with IPPA subscales Peer Communication (r = .613, p < .001) and Peer Trust (r = .566, p < .001). Similarly, the second subscale Depth had a strong positive correlation with the IPPA subscales Peer Communication (r = .531, p < .001) and Peer Trust (r = .453, p < .001). Finally, the third subscale Conflict had a moderate positive correlation with the IPPA subscale Peer Alienation (r = .374, p < .001). For discriminant validity, correlations between the QRI subscales and both internalizing and externalizing symptoms were explored. As expected, only the Conflict subscale (measuring the pathological aspect of peer relations) appeared to be correlated with internalizing (r = .269, p < .001) and externalizing (r = .348, p < .001) symptoms. The current study had as main objective the adaptation and validation of the QRI on a Peruvian sample. Following the results, we provide initial supportive evidence of the validity of the QRI as a measurement tool of the quality of peer relations among adolescents in a Spanish-speaking Peruvian population. Similar to other studies (Pierce et al., 1997; Verhofstadt et al., 2006), adequate internal reliability estimates confirmed the good functioning of the items for measuring support, depth, and conflict. Moreover, both CFA and MDS approaches established the three-factor internal structure of the instrument, with the exception of some malfunctioning items from the conflict scale. we found similarities with a psychometric study of the Dutch version of the QRI which also found a factor loading lower than .4 for item 25 within a Belgian sample of adult couples (Verhofstadt et al., 2006). We hypothesize these items are one of the reasons for lower fit indices. In this matter, we recommend a qualitative approach (focus group) to assess these items and their translation to further explore their functioning. Furthermore, the low estimate of CFI, and its inconsistency with RMSEA should be further explored, considering a series of elements, such as the baseline model’s fit function value, sample size and degrees of freedom, correlations in the observed data, and normality (Lai & Green, 2016). Regarding measurement invariance of the instrument across gender, important gender differences were found. Even though the instrument has been proven to be equally valid to measure the quality of relationships among both boys and girls adolescents, scalar measurement invariance was not accounted for, indicating that there is a difference of scores in this construct according to gender. More specifically, higher scores of support and depth were found among girls, indicating a trend where it seems to be easier for girls to engage in positive peer relations than for boys. Moreover, higher scores of conflict were found among boys. In this matter, it would be interesting for future research to further explore these gender differences. In particular, if girls of this cultural context seem to engage easier than boys in positive peer relations, it would be interesting to explore weather parental attachment remains more relevant for boys during adolescence, in comparison to girls, and in relation to psychological adjustment. Additionally and as expected, the subscales measuring positive aspects of peer relations (social support and depth) were highly associated with each other and with the positive subscales of the peer scale of the IPPA (communication and trust). Similarly, the negative scale of the QRI measuring conflict was associated with the negative scale from the IPPA peer alienation, and to both internalizing and externalizing symptoms, demonstrating that low quality of peer relationships is associated to anxiety, depression, rule-breaking, and aggressive behavior syndromes. The QRI differentiates itself from other measurements of peer attachment and peer support in the sense that it assesses the quality of relationships rather than attachment styles or general perceptions of support. The QRI use among adolescent populations allows to measure positive (such as depth and social support) and negative (conflict) aspects of peer relationships. This difference implies a higher value in terms of implications for intervention, as particular aspects of peer relations can be identified as risk or protective factors for psychological outcome. Nevertheless, we still stress the importance of other measurements that qualify attachment styles, such as secure, avoidant and anxious, or in a more recent perspective on a two-dimensional categorization of anxious and avoidant (Brenning, Soenens, Braet, & Bosmans, 2011), as they have their benefits for research purposes, such as the possibility of assessing stability of attachment styles over time. Another advantage of the QRI is its possibility of being used under the premise of answering it in function of the best friend. A recent article using the IPPA (Armsden & Greenberg, 1987) and the Adolescent Friendship Attachment Scale (AFAS; Wilkinson, 2008) concluded that the best friend scales added significantly to the prediction of depression, self-esteem, self-competence, and school attitude, beyond the contribution of the IPPA (Wilkinson, 2010). In this sense, using the QRI under the best friend premise may yield similar results. This study is the first to assess the psychometric properties of a self-report questionnaire about peer relations for adolescents in a Spanish-speaking Peruvian population. In addition, it is the first one to combine CFA and MDS analyses to assess the factor structure and dimensionality of the QRI. Results confirm previous findings and suggest that the QRI subscales are stable across countries and populations, with the exception of some items from the conflict subscale. Some limitations of this study can be mentioned. To begin with, the results are not to be generalized and can only be considered for adolescents attending public schools in Lima, Peru. Moreover, the measurements used were self-report questionnaires that could imply an information bias. This study was cross-sectional, and a longitudinal study could be useful to assess consistency and test-retest reliability. Finally, a further exploration of the data should explain why the RMSEA and CFI indices disagree, and what the implications of that inconsistency are. Recommendations for future research include a qualitative evaluation of the conflict subscale low functioning items in order to make changes that could improve their functioning. Additionally, we suggest further exploring gender differences in the matter of peer attachment among adolescents, and the psychometric assessment of this instrument in different Spanish-speaking populations and larger samples. To Gregory Pierce, Hamilton College, United States, for providing the original English version of the Quality of Relationships Inventory. This research received funding from the Fonds Dr. Pierre Vereecken from the University of Leuven, Belgium. Karen Yearwood, Nicole Vliegen and Jozef Corveleyn, Faculty of Psychology and Educational Sciences, KU Leuven, Belgium; Patrick Luyten, Research Department of Clinical, Educational and Health Psychology, University College London, United Kingdom, and Faculty of Psychology and Educational Sciences, KU Leuven, Belgium; Cecilia Chau, Departamento de Psicología, Pontificia Universidad Católica del Perú, Lima, Peru. Correspondence concerning this article should be addressed to Karen Yearwood, Faculty of Psychology and Educational Sciences, KU Leuven, Tiensestraat 102, PO Box 3720, 3000 Leuven, Belgium.